This hotel understands time. The Siam reflects its owners’ obsessions—with history, vintage cinema, jazz, antiques, the Siamese culture and the Art Deco design—but perhaps most importantly, with the glamour of fine living. The riverside plot of land on which the Siam stands has been in the Sukol family for more than four decades. As Krissada Sukosol Clapp—who incidentally is Thai pop culture phenomenon, a celebrity—inherited the land, he set about building a hotel as a means to house his substantial collection of antiques. The location in the sleepy Royal quarter (with the king’s palace near by) is somewhat marginal, but it does go well with the hotel’s atmosphere. 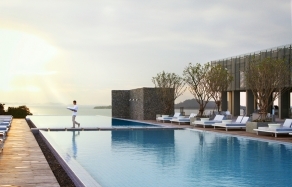 Starting from the cosy and welcoming quasi-Moroccan courtyard by the main lobby, through the soaring, black-and-white atrium dominated by palm trees reflected in a spectacular water feature, and ending in gardens and pool villas by the river, the Siam offers a gorgeous string of quiet spaces. The hotel vision was born from a collaboration between Krissada and the resort designer-superstar Bill Bensley. Known for sleek and exotic luxury resorts, this time the architect ventured into a somewhat different realm. A 19th-century Thailand style with strong undercurrents of art deco aesthetic permeates the hotel. The interiors are filled with collections of old maps, film posters and theatre artefacts, precious antiques as well as curios and objet d’art, including the assemblage of brass instruments above the Deco Bar. Somehow, between all this, the design remains thoroughly Thai. It’s as much a celebration of Thailand’s cultural heritage as it is an echo of a refined taste—every collectible here comes from the owner’s private stock. 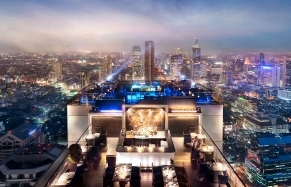 The designer injected the hotel with contrasts, representing the eclectic character of the Siam. The hammam-inspired Spa is dark, sleek and moody, atrium light and majestic, courtyards and verandas tranquil and the riverfront restaurant area mixes traditional, restored buildings with a tall glass facade. Closer to the architect’s usual brief are the few standalone guest houses, build in a style closely following Thai traditions. As the first in Bangkok pool villas, they represent the top-end in the city’s accommodation selection. Other rooms are very comfortable too and offer plenty of space—and all guests can count on a personal butler to assist at a moment’s notice. The Siam is the first hotel in Bangkok to come equipped with a professional Thai Boxing ring and gym. Guests can enrol in training programs (accompanied by a dietary regime), which the instructors adapt to individual abilities and fitness levels. That’s not the only thing to do at the hotel. Over the couple of days at the hotel we checked out the beautifully designed spa, had drinks and dined at the Siam’s restaurants and bars (of which there are many, for such a small hotel), took a boat ride on the Chao Phraya river and lost ourselves in the boutique curio shop stocked with items from the Sukol family’s private collection. The highlight was trying out the excellent Elephant coffee, preparation of which is an attraction in itself. This very special urban resort in Bangkok embraces the experience of luxury in its most precious aspect: time. It offers a perfect escape from the busy metropolis, and its charming rooms and spaces reflect on Thailand's heritage and history. We award The Siam with the Editor's Pick. Personal butler, in-room check-in, intuitive service and great concierge. We had our wishes anticipated on more than one occasion, e.g. when the staff did an online check-in for us for the departure flight. Bangkok’s first pool villas, beautifully designed and comfortable, set in green gardens and with a direct access to the riverfront. Great concept of the hotel overall, and its serene atmosphere. The textures and contrasts of the design—the simplicity of architecture acts as a canvas to the lovely assemblage of art, vintage artefacts as well as genuine, priceless museum pieces (a Chinese terracotta sculpture in the lobby is thousands of years old). Lots of stylish places to hang-out—it's difficult to pick our favourite one! Served at the hotel is the extremely rare “Elephant Coffee”, produced by the Black Ivory Coffee. It's a truly unique thing. Before the coffee beans are ground, they are broken down by the elephant's digestive enzymes—you read that right—and as we tested, the result is in a smooth tasting coffee without bitterness. It's a privilege to try it. Limousine service from the airport is excellent. The hotel is some 45-minute by car from the Suvarnabhumi International Airport.